With inventory in Greater Portland currently so low, many of my buyer clients are turning to new construction for their home purchase. You can not only get the home that you want, exactly the way you want it - you can usually do that within your budget. If building a new home is of interest to you, make sure you choose a realtor who has experience with new construction to guide you through the process. We are very fortunate to have some great builders in this area who are able to do what we call a “turn key” build package. What this means is that you no longer have to take out an expensive and hard to come by construction loan; these builders will front the money for the project and you will close one time on the house when it is completed. During the process you can be as involved (or not involved) as you would like to be. Most buyers love the fact that they can choose every aspect of the home, from the lot to the home style, to siding color to the kitchen design. New construction does differ in a few ways. One is that the builder will likely require a significant non-refundable deposit to start the project. Since they are fronting all of the money, they want assurance that you will make every effort to close on the property. The deposit can range from 3-20% depending on the builder and the cost of the home. The next difference is that there will be two appraisals done, one at the beginning of the process once you are under contract, to ensure that the home is worth the amount that you are under contract for. 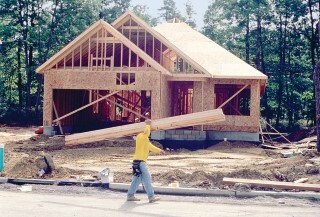 The second appraisal will happen when the home is completed to ensure it was finished according to the specifications. The third thing that is different is that you receive a one year home warranty with all new construction projects in the state of Maine. If you’re not finding a home you like on the market, or have always dreamed of building a new home - you should absolutely explore this option.